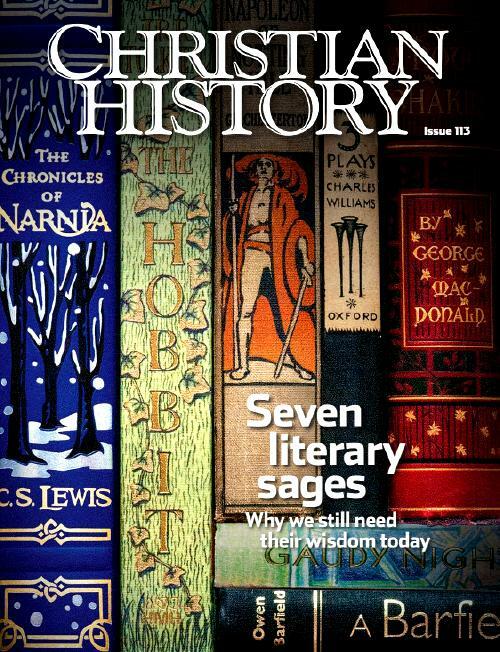 Christian History Magazine gives us an issue about "Seven Literary Sages." The seven are George MacDonald, G.K. Chesterton, J.R.R. Tolkien, C.S. Lewis, Dorothy L. Sayers, Charles Williams, and Owen Barfield, four of whom were Inklings, two influenced the Inklings and one was a contemporary non-Inkling. The magazine is full of informative articles about them including one that would be a good introduction: "The seven sages," with brief biographies of each author. Another page of "Recommended Resources" includes "Begin with" and "You might also like" lists of works by the authors. The entire magazine can be downloaded free as a pdf through a link here and each of the articles can be read online through links here. .... Not only was she the only high-profile woman in a church completely dominated by men, but she was also eccentric, was married to a divorced man, and had borne a child out of wedlock. Yet she played a leading role in the renewal of Christian drama and applied her knowledge of the Bible and the creeds to the problems of her generation. In so doing she proclaimed a genuine Christian approach to art and voiced a powerful theology of work.